One Owner, Non-smoker, Trade-in, Ex-lease, Local, Certified, Am / Fm / Cd Player, Sirius Xm Satellite Ready, Bluetooth, Dual Zone Climate Control, Air! Hot Deal! We've marked this unit down $1228 from its regular price of $39995. The Toyota Tundra gives the domestic trucks a run for their money. 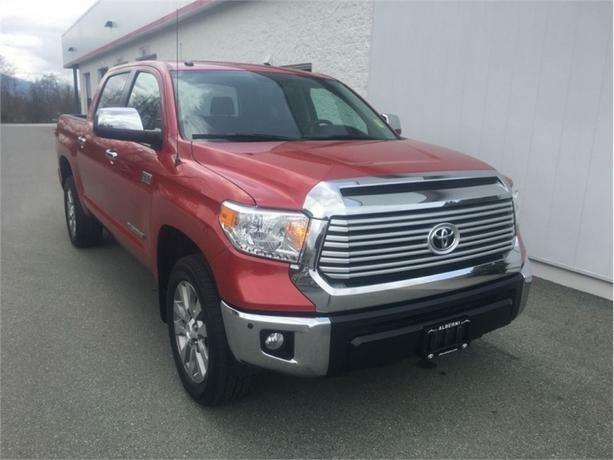 This 2015 Toyota Tundra is for sale today in Port Alberni. The 2015 Toyota Tundra is a full-size truck that works hard and plays hard, but with a long list of luxury features to pamper you. With 10 models and 25 option packages available, there is a Tundra built to fit nearly anyone who is in the market for a well-appointed full-size pickup. Whether it is working hard at the jobsite or hauling a camper or boat for a weekend excursion, the Tundra takes care of your hard work with ease and takes care of you as well.This crew cab 4X4 pickup has 92499 kms and is a Certified Pre-Owned vehicle. It's barcelona red met in colour and is completely accident free based on the CarProof Report. It has an automatic transmission and is powered by a 381HP 5.7L 8 Cylinder Engine. This vehicle also has the following features: Am / Fm / Cd Player, Sirius Xm Satellite Ready, Bluetooth, Dual Zone Climate Control, Air, Tilt, Steering Wheel Controls. It has a certified used vehicle warranty for added peace of mind. Our Tundra's trim level is Limited. Our 4X4 Limited Double Cab comes standard with leather, heated front bucket seats, power sliding rear window, clearance and backup sensors, 18-in alloy wheels, billet grille, Bilstein shocks, all-terrain tires and a 2,480 kg/5,467 lbs towing capacity.